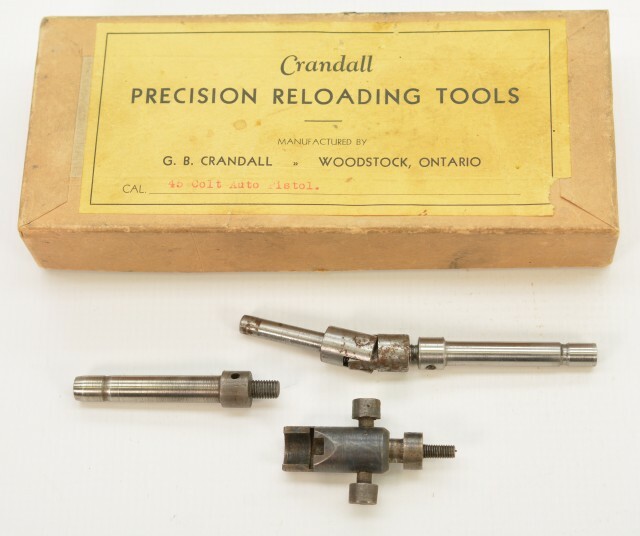 Description: This buff 7 3/4 X 3 1/4 X 1 1/4 inch box wears a yellow label reading "Crandall Precision Reloading Tools Manufactured by G.B. Crandal, Woodstock, Ontario Cal. 45 Colt Auto Pistol" box contains a priming arm with .357 magnum or 38 spcial size shellholder and two nose punches for seating bullets along with an arm these attach to. These parts must fit a Crandall product. Gladstone Blake Crandall was a well known Canadian Gunsmith. He patented a rifle sight in 1907 and a powder measure in 1953. He built Tobin shotguns from parts after purchasing name and parts at factory closing. He is described as "The No. 1 Custom Gunsmith of the Dominion of Canada" in Charles Landis' 22 Caliber Varmint Rifles book. This book extensively describes his wildcat cartridges, loading tools, custom rifles, swaged bullets and various other endeavors. Box remains in very good condition with light soiling and a small corner missing from label. Tools show a few scattered specks of oxidation. 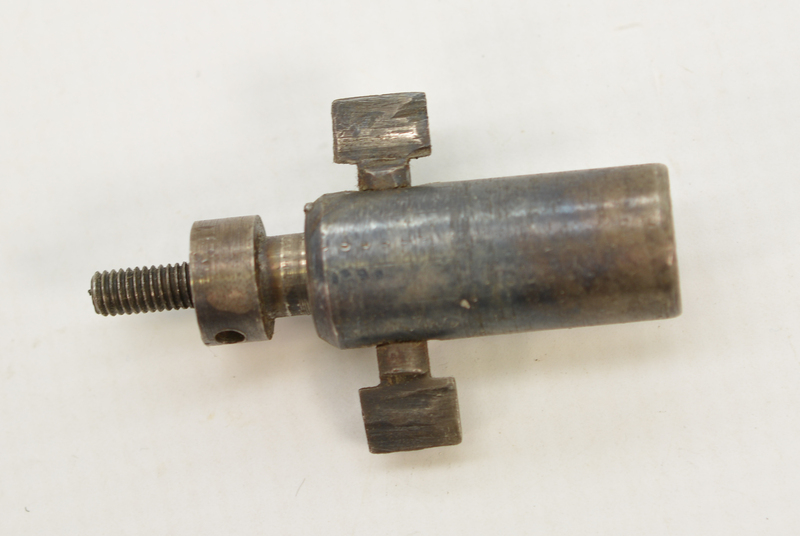 This is a fine box for the tool collector from a pioneer in rifle and cartridge development.